Locals sometimes refer, half-jokingly, to the winding and ancient lane upon which one finds Trengilly Wartha as the ‘Constantine bypass’ – a lovely little road which passes by the head of Polwheveral Creek and through the tiny hamlet of Nancenoy. The property offers six guest rooms in all, while there’s also a recently built Garden Annexe around a hundred feet from the main building itself. Being a free house, the Trengilly offers a regularly changing array of unusual ales as well as a wide selection of wines and malt whiskies – it’s as popular with local residents as guests. Food is available both in the bar and the quieter bistro. 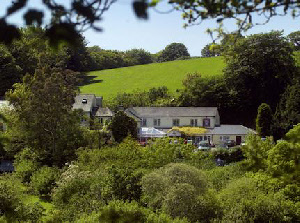 Once a modest farmstead (probably dating from the late eighteenth or early nineteenth centuries), its name means “settlement above the trees” in Cornish. Indeed, its surroundings have probably changed very little since it was first built. The thriving village of Constantine is only a mile away, while the pretty waterside hamlet of Port Navas is a little further to the east. There are also several places to visit nearby, including the National Seal Sanctuary at Gweek and the world-famous gardens of Trebah and Glendurgan at Mawnan Smith. Well behaved dogs are welcome for a small supplementary charge.